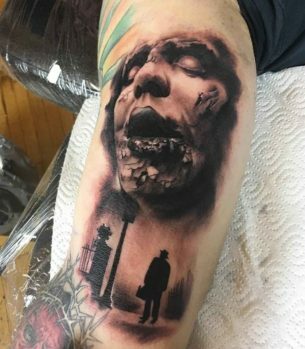 Horror is a special genre of modern art which frightens audience not simply with images of blood, guts, smashed brains etc. but rather with an atmosphere of suspense. 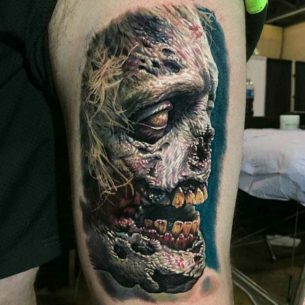 Horror tattoos are of that kind which is not pleasant to see, but impossible to tear one’s eyes away. The horror genre appeared in cinema and literature at the end of 1890-s. In 1896 Georges Méliès makes the movie The Haunted Castle and leads in the world usage of special effects – stop-motion techniques, time-lapse photography, multi-exposure etc. In 1920 Friedrich Wilhelm Murnau creates a big screen version of a Bram Stocker’s novel “Dracula”. In this way he created the image of the vampire and makes it recognizable and “Nosferatu, a Symphony of Horror” was the movie which made this image known all over the world. In the 20-s the movie gains its sound and the genre of horror develops to the new level. In 1928 the “Terror” was shown in cinemas, where people again hear the cinematic sound. The movie gave the whole picture of the horror genre of that time, unfortunately, it is considered to be lost. 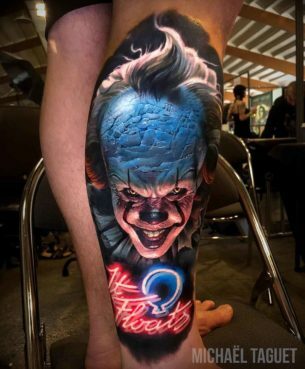 Horror stories and movies hold their audience in suspense and unbearable tension, they tickle nerves and play with imagination at the emotional edge. The plot can develop around different supernatural characters – zombies, ghosts, demons as well as different maniacs, psychos, murderers. The Good fights against Evil and it is not obliged that the first one should always win. The stories of successful horrors are peppered with some shades of psychological games they play with the audience. Such artworks prove that to terrify someone there sometimes is no need of detailed visualization of somebody getting ripped apart. The horror is not for everybody. As Stephen King once said, the majority adores getting frightened, but the majority is not everybody and fears never disappears with age it just transforms. The fear in front of unknown – supernatural creatures, unexplainable mystical events. The main and the most difficult horror author’s task is to create and maintain the creepy atmosphere through the whole composition. Unpredictable plot twists, imagery, chains of events – all of these are aimed at an emotional response. Unfortunately, due to the high popularity of the genre, it gained overused clichés. Plenty of second-rate creations with routine plot stories full of clichés are produced annually, so the demand on high-quality horrors only grows. 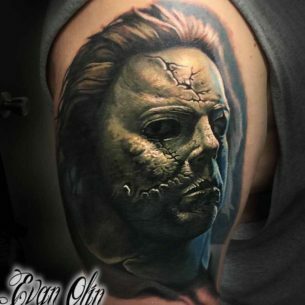 The images of the famous horror movies or some characters and pictures produced by your own imagination – all would stick to the genre as long it is at least creepy, there are no restrictions. 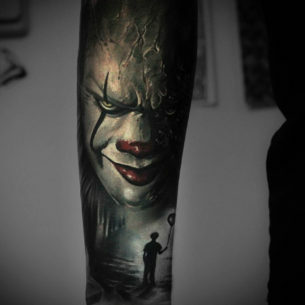 The realistic style prevails in tattoos of this kind. 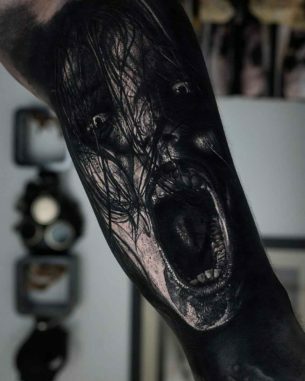 Red blood flowing down the face, the frozen moment of terror on the face, creepy portraits – there are only realistic techniques capable of depicting correctly the mix of tension and disgust of these scenes. These life-like pictures can be too much for some sensitive and emotional people, so it is better not to take this risk. 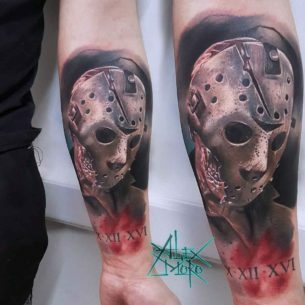 Such people are inclined to overreact and sometimes, for example, religiously-minded individuals are against this kind of tattoo art, even if they love it in general. They express their negative attitude very devotedly with predictable and clear language: “How can one love this disgusting blood and flesh on their body?”, “What a freaks!”, “Satan’s adepts!” Any who is currently thinking about making a horror tattoo, should be ready to suffer all these judgmental comments of your parents and relatives, friends and, of course, an army of strangers, who have nothing to do with you and your body art, but they will definitely become your main critics. 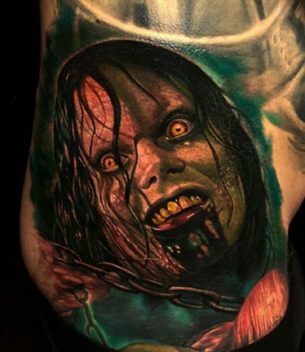 Especially, it concerns girls with “ugly” tattoos of the genre. Take into consideration the consequences it can cause. 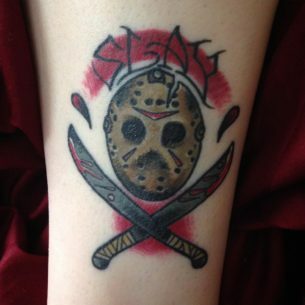 Remember, that people have a very bad habit to overreact to “normal” tattoo design, especially to ideas of the horror genre. 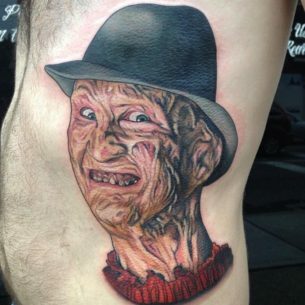 And you can get bored with such a creepy picture on your body. So, you better think twice. 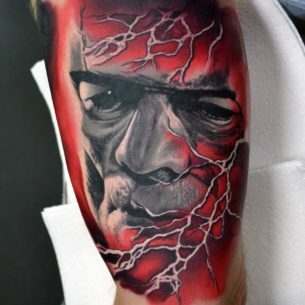 ☠ Go to the professional tattoo shop and work only with a professional tattoo artist specialized in realistic tattoos. 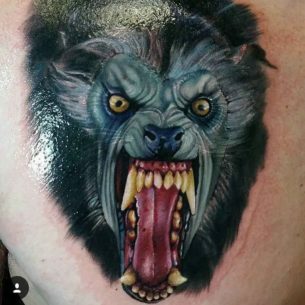 It is necessary if you want your body drawing to terrify surrounding with its life-likeness but not with its awful quality, you should work with artists who had years of experience creating realistic artworks, who know what they are doing and what they are doing it for. The artists who’ve proven their skill level with numerous satisfied clients. 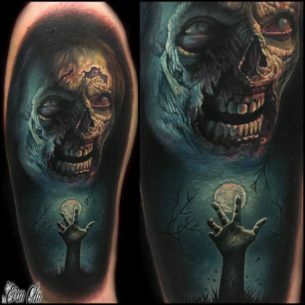 ☠ Create the tattoo idea together with an artist. 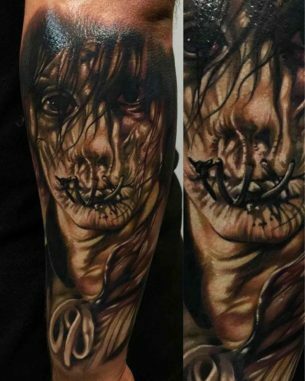 The horror tattoos are made in dark and intense shades of colors. There are no small-sized horror designs. 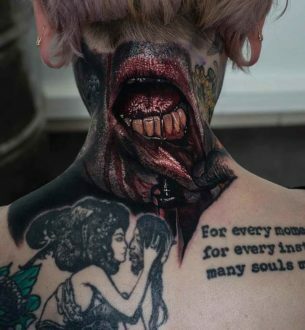 It is better to make it big and impressive once than to correct and cover this tattoo with a bigger one later.